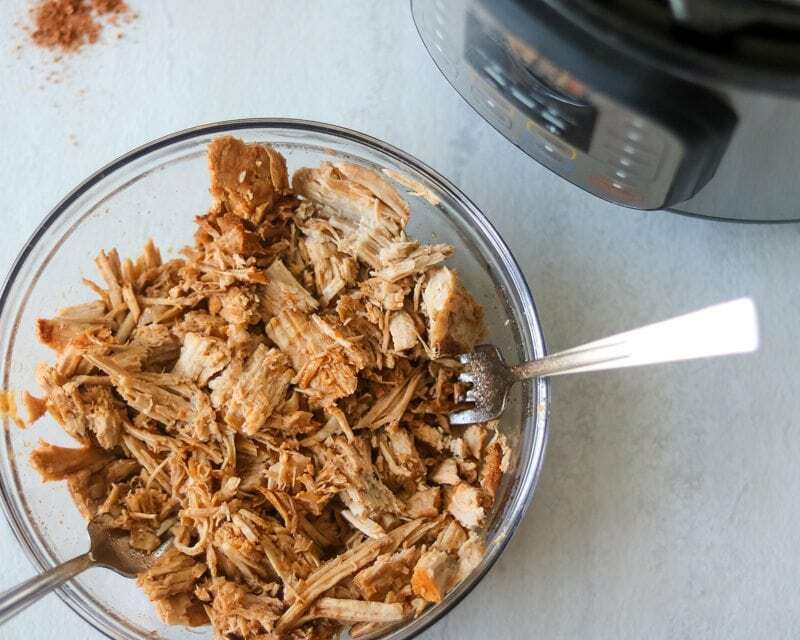 Instant Pot Pulled Pork: Barbecue Pork Sandwiches have never been easier with the help of the Instant Pot! 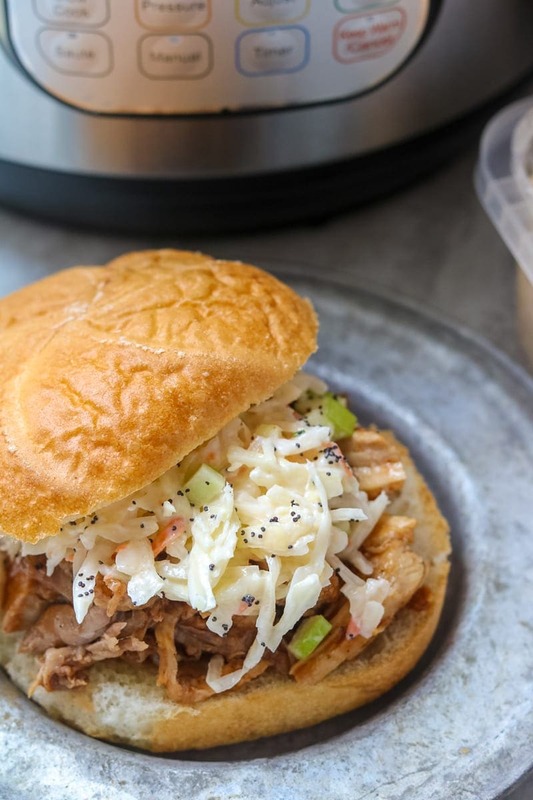 Pork loin is cooked in the pressure cooker until tender in a delicious blend of seasonings and then served up on buns with coleslaw for a recipe worth entertaining with! This post has been sponsored by BJ’s Wholesale Club, but as always, the recipe and opinions stated are my own. 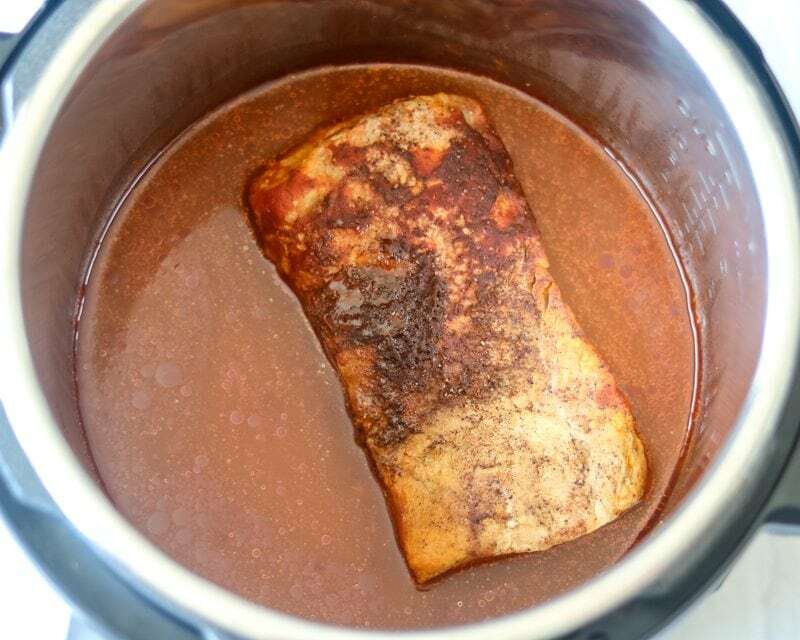 Did you know one of my very first recipes on this blog was for Slow Cooker Pulled Pork? It is such an easy recipe and has become a fan favorite, along with Creamy Cheesy Chicken and Rice, Slow Cooker BBQ Drumsticks and Homemade Rotisserie Chicken. But many of you have asked for me to update my pulled pork recipe to be made in the pressure cooker. And so that is just what I have done for you! I don’t know many people who don’t love barbecue pork, but that is not the only reason pulled pork is the perfect party food. 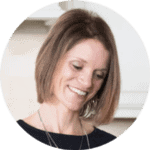 AND my recipe is gluten-free–so your gluten-free or low-carb party guests can skip the buns and still enjoy the main entree! BBQ Pork Sandwiches are especially good with grilled fries, BLT potato salad and baked beans. Throw in veggie and fruit trays from BJs, and you have the makings of a great summer dinner party. And if you are looking for a dessert or custom cake, be sure to check out BJ’s Perfect Party Planning Center. You can place your bakery order online and then go pick up in-club in as little as 36 hours. 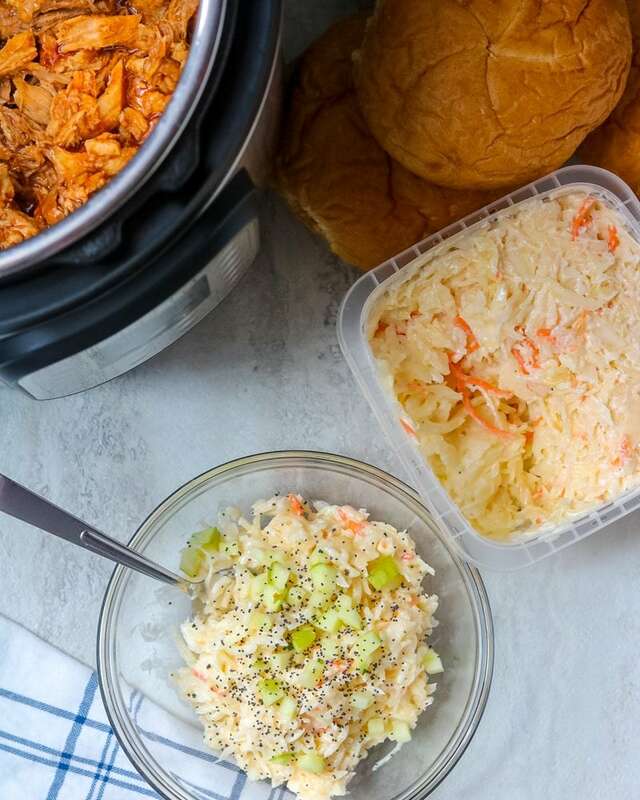 Grab your bakery goods and a few fruit and veggie trays, along with the makings for this Instant Pot Shredded Pork and you are well on your way to happy dinner guests! 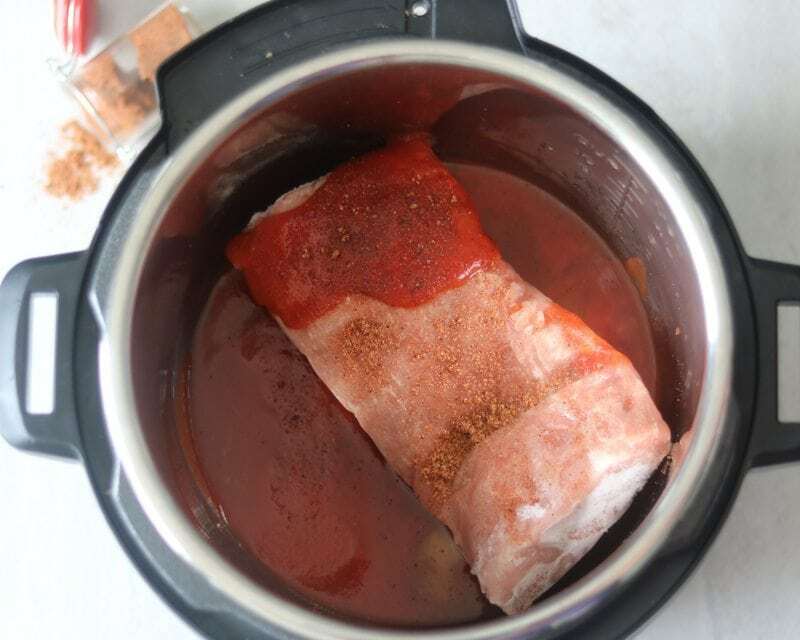 The trickiest part to making pork loin in your instant pot, is making sure you can FIT your pork into your instant pot. I recommend using 2-3 pound pork loins, so that you can ensure that your pork will fit in your pressure cooker. One of the advantages of being a BJ’s members, is that I can have BJ’s butchers custom cut and repackage my meat at no charge. I simply ask them to cut my pork loin into 3 pound sections when I purchase the pork. I then can freeze what I am not planning to use right away for future meals like Pork Carnitas, Instant Pot Pork Tacos, or Apple Pork Loin Roast. Step One: Place pork loin in Instant Pot. You can sear your meat first, but I often pull out a frozen pork loin right from the freezer to make pulled pork, so I skip the searing step. To sear meat in your instant pot, turn your pressure cooker to Saute and pour in 1 tablespoon oil. Wait until your pressure cooker reads Hot. Sear your meat 2-3 minutes per side until browned. Be sure to scrap up any browned bits on bottom of your inner pot, so that pressure can build appropriately and you won’t get a burn notice. *You may need to cut your pork loin into two pieces to sear in your instant pot. And searing is an OPTIONAL step. Step Two: Add liquids and tomato sauce to Instant Pot. I love to cook my pulled pork in apple juice or apple cider for an amazing flavor that helps develop a delicious homemade barbecue sauce. However, beer is another great option, and chicken stock will work as well. *Remember if you use beer, your instant pot pulled pork will no longer be gluten free. Step Three: Cook the Pork Loin in the Pressure Cooker. Set your pressure cooker to high pressure for 20 minutes per pound if fresh. Set your pressure cooker to high pressure for 30 minutes per pound if frozen. You can set high pressure on your Instant Pot by hitting the manual button or pressure cook button on your pressure cooker until high pressure lights up. To adjust the time use the + and – buttons. Read more about this on Instant Pot Functions. Step Four: Allow Pressure to Release. It is very important to allow the pressure to release naturally when cooking large cuts of meat in your instant pot. If you release pressure, your pork loin can become tough, making it difficult to shred. Step Five: Remove pork loin from inner pot and place in large bowl. Place your pork loin into a large bowl and use 2 forks or a hand-held kitchen mixer to shred meat. If you have difficulty shredding your meat, place your pork loin on a cutting board and cut into small chunks. Step Six: Make your homemade barbecue sauce. There is now lots of liquid left in the inner pot of your instant pot. This liquid will become your barbecue sauce. Simply turn your instant pot to saute function–on high. With the lid off your pressure cooker, let the sauce come to a boil and thicken. This takes me between 3-7 minutes. Use the thickened sauce to spoon over shredded meat for barbecue shredded pork. Of course, you can skip the step of making the BBQ sauce from the cooking liquids and serve pork as is, or with your favorite bottled jar of barbecue sauce. Make a Grilled BBQ Pizza. Top a bun with a generous serving of the pulled pork and a scoop of Wellsley Farms Coleslaw. 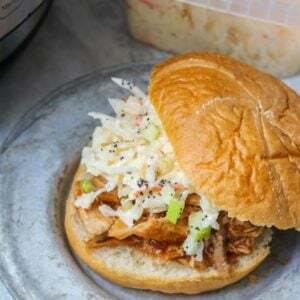 My family’s favorite way to eat pulled pork is to pile a bun high with the shredded pork and then top with coleslaw. I love to dress up Wellsley Farms Coleslaw with some freshly diced granny smith apples and some poppy seeds. The combination of tender pork cooked in apple juice with the creamy slaw studded with fresh apples, creates a perfect marriage of flavors. If you have leftover pulled pork, you can freeze the leftover barbecue pork in 2-3 cup portions for up to 3 months. Pull out of freezer for a quick dinner. To reheat frozen pork, first let pork thaw out overnight in fridge. Then follow one of these methods for reheating meat. Reheat thawed pork in the microwave for a couple minutes. Place frozen OR thawed meat in slow cooker with a 1/2 cup apple juice or stock and cook on low until reheated–3-4 hours. Pork loin is cooked until tender in a delicious blend of seasonings and then served up on buns with coleslaw for a recipe worth entertaining with! Combine the dry spices and cover pork with the mixture. Place in pork in inner pot of instant pot. Combine the juice, vinegar, honey, and tomato sauce, and pour over the pork. Cook on high pressure for 20 minutes per pound if fresh pork loin and 30 minutes per pound if frozen pork loin. Allow pressure to release naturally. Once pork is cooked, remove pork loin from Instant pot and place in large bowl. 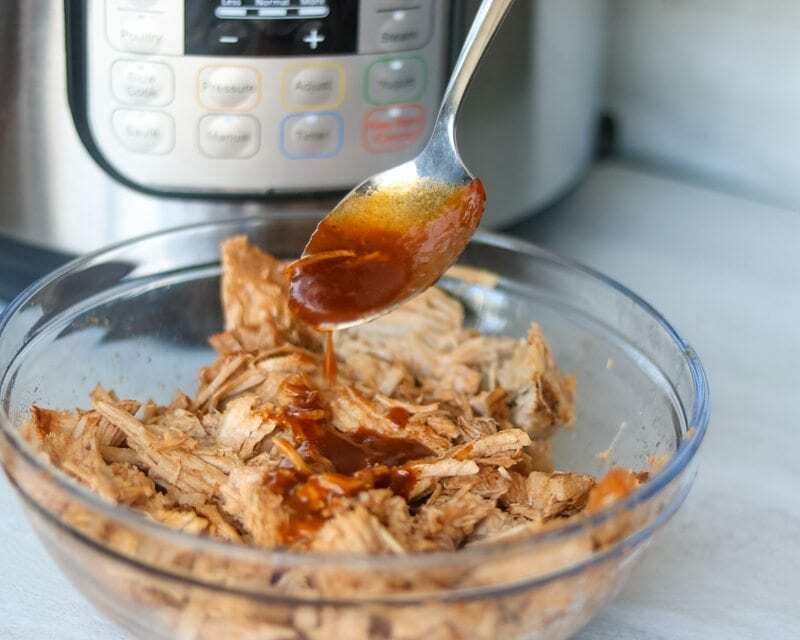 Shred pork with 2 forks or hand held mixer. Turn Instant Pot to saute function, on high. Let cooking liquid come to a boil and thicken for 3-5 minutes. Spoon thickened sauce over shredded meat and serve. Optional: To sear meat in your instant pot, turn your pressure cooker to Saute and pour in 1 tablespoon oil. Wait until your pressure cooker reads Hot, and then season your meat with the dry seasonings, and sear your meat 2-3 minutes per side until browned. Be sure to scrap up any browned bits on bottom of your inner pot, so that pressure can build appropriately and you won't get a burn notice. You may need to cut your pork loin into two pieces to sear in your instant pot. Use Maple Syrup to keep this Pulled Pork Paleo. Feel free to use brown sugar in place of honey or maple syrup as well. 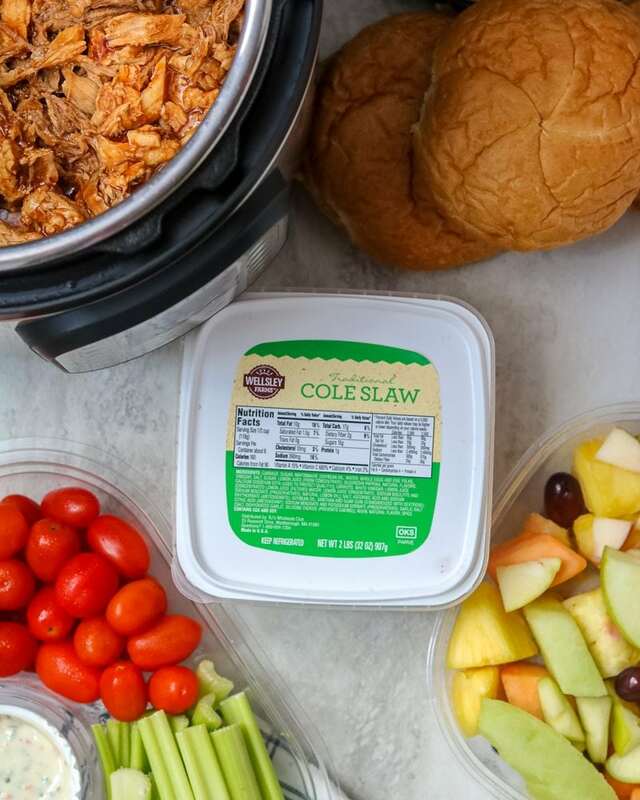 If you are having a large party, ordering a deli or sandwich platter from BJ’s Perfect Party Planning Center, in addition to making pulled pork, is a great budget-friendly way to round out a party menu. I need to make this in my instant pot! It looks so good! I hope you do give it a try Krista. We love it here. This looks amazing!! Perfect for Summer BBQs! Exactly–a great meal for a party ANY day! Pulled pork is always a great party food! The IP makes it so easy and delicious! What a great idea to use an IP! I need to try this. It looks so easy! My oldest loves pulled pork and orders it whenever it’s on the menu. Can’t wait to make this for him at home now! Oh yay!! This is sure to be a winner! I hope your boy enjoys Jen! This looks amaaazing!! I love that you made it in the Instant Pot! You will love it Erin! 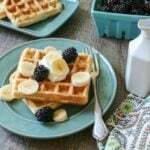 I am new to this site and I am enthused with the recipes. Would a lean pork tenderloin work as well in this pulled pork recipe? I took a 1.84lb roast out of the freezer but the recommendation for time was nowhere near enough. It took almost 2hrs to be shreddable but since I opened it to check twice I know that added more time. However, cooking it in beer was a great tip and I used a pineapple IPA and it added a great touch. Hi Jamie! I am sorry it took longer to cook. Did you let pressure release naturally? If you do a quick release it will cause the meat to seize up and makes it difficult to shred. Also–pineapple IPA? Sound SPECTACULAR for pork. Did you put the pork on the trivet or just lay it on the bottom of the pot? 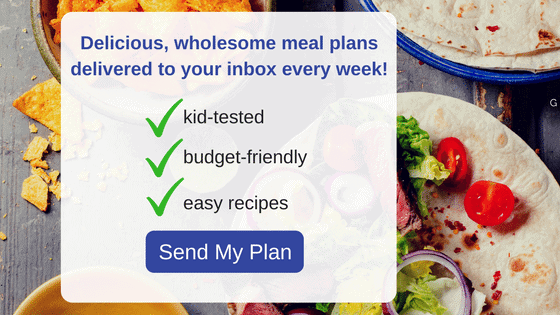 The recipe looks great – planning on making it this weekend! Can you cook baked potatoes the same time that you cook the pulled pork in the pressure cooker? Hi Cohn! So technically, yes you can–but the time it would take to cook a 3 pound pork loin is 3x longer than what is needed for a potato. So you run the risk of over cooking potatoes and may be hard to fit everything in your IP at once. I would cook your potatoes while you are shredding your pork (just 10-15 minutes in your IP) and enjoy! This came out wonderfully. My only quibble is with the dry seasonings – between the 2 tbs of paprika and a tbs of chili powder (which has paprika), I came our with a finished product that was close to being over powered by the spice. I know different regions have different tastes in BBQ (we’re originally from Florida and we are still adapting to North Carolina BBQ), but I think I’m going to tone it down just a bit next time. Other than that – the meat was tender and flavorful! Thanks!!! Hi Bryan! I think it is always best to adapt recipes to your preference. We love the spice here, but I understand it may not be fore everyone. Glad the meat turned out tender though!